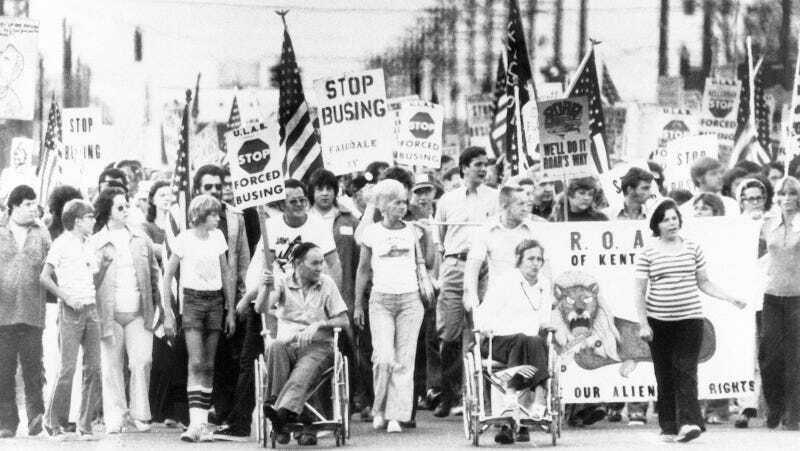 Protestors in Jefferson County, KY march against court-ordered school desegregation busing on August 31, 1976. Image via AP Photo. House Bill 151, which passed the newly GOP-controlled Kentucky House of Representatives and is awaiting approval from the GOP-controlled Kentucky Senate, would effectively re-segregate schools in Kentucky’s largest district by requiring districts to allow children to attend the school closest to their home, destroying uniquely successful desegregation efforts that have kept Jefferson County schools racially and economically diverse in spite of a deeply segregated housing system. “This is a bill that will resegregate our schools, taking us back to the ’60s and ’70s,” Chris Kolb, a member of the Jefferson County school board—which opposes the bill—told the Washington Post. “This will be the death of integration.” Rep. Darryl Owens (D-Louisville) called the bill “shameful and shocking.” The bill would affect other counties in Kentucky, but none would be so impacted as Jefferson County, which has 101,000 students, over half of which would be moved to a new school, according to the Post. “Under the guise of ‘neighborhood schools’ they seek to take us back to the land of alleged separate but equal schools, which was held unconstitutional by the U.S. Supreme Court in 1954,” Louisville NAACP president Raoul Cunningham wrote in a letter. Gov. Matt Bevin did not respond to a request from the Post as to whether he supports the bill, which is likely to pass through the Kentucky Senate. Schools in the South, once the most segregated in the country, had by the 1970s become the most integrated, typically as a result of federal court orders. But since 2000, judges have released hundreds of school districts, from Mississippi to Virginia, from court-enforced integration, and many of these districts have followed the same path as Tuscaloosa’s — back toward segregation. Black children across the South now attend majority-black schools at levels not seen in four decades. Nationally, the achievement gap between black and white students, which greatly narrowed during the era in which schools grew more integrated, widened as they became less so. Desegregated schools have had visible social and economic benefits for the city of Louisville, the Atlantic noted, from higher achievement for low-income students to students harboring fewer stereotypes to stabilizing home values; housing segregation remains a problem in Louisville, but a 2013 study showed that school desegregation helped housing segregation fall approximately 22% between 1990 and 2010. It’s harder for children in faraway schools to participate in extracurricular activities, he said, and for their parents to make it to PTA meetings and teacher conferences. What’s more, he said, busing costs student time and taxpayer money that could be better spent. Bratcher cited his own experience in a county high school in the 1970s, when he was forced to leave his neighborhood and take a bus to a historically black school 45 minutes away. Hm, no, seems like allowing minority kids to receive a good education is still probably more important than those things, although that inconvenient fact certainly won’t stop the Republican party from dragging us back into the 1950s.